Proprietary Name: Invanz What is the Proprietary Name? Non-Proprietary Name: Ertapenem Sodium What is the Non-Proprietary Name? 0006 - Merck Sharp & Dohme Corp.
Invanz with NDC 0006-3843 is a a human prescription drug product labeled by Merck Sharp & Dohme Corp.. The generic name of Invanz is ertapenem sodium. The product's dosage form is injection, powder, lyophilized, for solution and is administered via intramuscular; intravenous form. Labeler Name: Merck Sharp & Dohme Corp. Dosage Form: Injection, Powder, Lyophilized, For Solution - A dosage form intended for the solution prepared by lyophilization ("freeze drying"), a process which involves the removal of water from products in the frozen state at extremely low pressures; this is intended for subsequent addition of liquid to create a solution that conforms in all respects to the requirements for Injections. Intravenous - Administration within or into a vein or veins. FDA Application Number: NDA021337 What is the FDA Application Number? Start Marketing Date: 11-21-2001 What is the Start Marketing Date? Why is ertapenem injection medication prescribed? To reduce the development of drug-resistant bacteria and maintain the effectiveness of INVANZ® and other antibacterial drugs, INVANZ should be used only to treat or prevent infections that are proven or strongly suspected to be caused by susceptible bacteria. When culture and susceptibility information are available, they should be considered in selecting or modifying antibacterial therapy. In the absence of such data, local epidemiology and susceptibility patterns may contribute to the empiric selection of therapy.TreatmentINVANZ is indicated for the treatment of adult patients and pediatric patients (3 months of age and older) with the following moderate to severe infections caused by susceptible isolates of the designated microorganisms [see Dosage and Administration (2)]. INVANZ is indicated for the treatment of complicated intra-abdominal infections due to Escherichia coli, Clostridium clostridioforme, Eubacterium lentum, Peptostreptococcus species, Bacteroides fragilis, Bacteroides distasonis, Bacteroides ovatus, Bacteroides thetaiotaomicron, or Bacteroides uniformis. INVANZ is indicated for the treatment of complicated skin and skin structure infections, including diabetic foot infections without osteomyelitis due to Staphylococcus aureus (methicillin susceptible isolates only), Streptococcus agalactiae, Streptococcus pyogenes, Escherichia coli, Klebsiella pneumoniae, Proteus mirabilis, Bacteroides fragilis, Peptostreptococcus species, Porphyromonas asaccharolytica, or Prevotella bivia. INVANZ has not been studied in diabetic foot infections with concomitant osteomyelitis [see Clinical Studies (14)]. INVANZ is indicated for the treatment of community acquired pneumonia due to Streptococcus pneumoniae (penicillin susceptible isolates only) including cases with concurrent bacteremia, Haemophilus influenzae (beta-lactamase negative isolates only), or Moraxella catarrhalis. INVANZ is indicated for the treatment of complicated urinary tract infections including pyelonephritis due to Escherichia coli, including cases with concurrent bacteremia, or Klebsiella pneumoniae. INVANZ is indicated for the prevention of surgical site infection following elective colorectal surgery. For Intravenous or Intramuscular UseDO NOT MIX OR CO-INFUSE INVANZ WITH OTHER MEDICATIONS. DO NOT USE DILUENTS CONTAINING DEXTROSE (α-D-GLUCOSE).INVANZ may be administered by intravenous infusion for up to 14 days or intramuscular injection for up to 7 days. When administered intravenously, INVANZ should be infused over a period of 30 minutes. Intramuscular administration of INVANZ may be used as an alternative to intravenous administration in the treatment of those infections for which intramuscular therapy is appropriate. INVANZ may be used for the treatment of infections in adult patients with renal impairment. In patients whose creatinine clearance is >30 mL/min/1.73 m2, no dosage adjustment is necessary. Adult patients with severe renal impairment (creatinine clearance ≤30 mL/min/1.73 m2) and end-stage renal disease (creatinine clearance ≤10 mL/min/1.73 m2) should receive 500 mg daily. A supplementary dose of 150 mg is recommended if ertapenem is administered within 6 hours prior to hemodialysis. There are no data in pediatric patients with renal impairment. No dose adjustment recommendations can be made in patients with hepatic impairment [see Use in Specific Populations (8.7) and Clinical Pharmacology (12.3)]. VialsAdults and pediatric patients 13 years of age and olderPreparation for intravenous administration:DO NOT MIX OR CO-INFUSE INVANZ WITH OTHER MEDICATIONS. DO NOT USE DILUENTS CONTAINING DEXTROSE (α-D-GLUCOSE). INVANZ MUST BE RECONSTITUTED AND THEN DILUTED PRIOR TO ADMINISTRATION. Reconstitute the contents of a 1 g vial of INVANZ with 10 mL of one of the following: Water for Injection, 0.9% Sodium Chloride Injection or Bacteriostatic Water for Injection.Shake well to dissolve and immediately transfer contents of the reconstituted vial to 50 mL of 0.9% Sodium Chloride Injection.Complete the infusion within 6 hours of reconstitution.Preparation for intramuscular administration: INVANZ MUST BE RECONSTITUTED PRIOR TO ADMINISTRATION. Reconstitute the contents of a 1 g vial of INVANZ with 3.2 mL of 1.0% lidocaine HCl injectionRefer to the prescribing information for lidocaine HCl. (without epinephrine). Shake vial thoroughly to form solution.Immediately withdraw the contents of the vial and administer by deep intramuscular injection into a large muscle mass (such as the gluteal muscles or lateral part of the thigh).The reconstituted IM solution should be used within 1 hour after preparation. NOTE: THE RECONSTITUTED SOLUTION SHOULD NOT BE ADMINISTERED INTRAVENOUSLY. Pediatric patients 3 months to 12 years of agePreparation for intravenous administration:DO NOT MIX OR CO-INFUSE INVANZ WITH OTHER MEDICATIONS. DO NOT USE DILUENTS CONTAINING DEXTROSE (α-D-GLUCOSE).INVANZ MUST BE RECONSTITUTED AND THEN DILUTED PRIOR TO ADMINISTRATION.Reconstitute the contents of a 1 g vial of INVANZ with 10 mL of one of the following: Water for Injection, 0.9% Sodium Chloride Injection or Bacteriostatic Water for Injection.Shake well to dissolve and immediately withdraw a volume equal to 15 mg/kg of body weight (not to exceed 1 g/day) and dilute in 0.9% Sodium Chloride Injection to a final concentration of 20 mg/mL or less.Complete the infusion within 6 hours of reconstitution.Preparation for intramuscular administration:INVANZ MUST BE RECONSTITUTED PRIOR TO ADMINISTRATION.Reconstitute the contents of a 1 g vial of INVANZ with 3.2 mL of 1.0% lidocaine HCl injection (without epinephrine). Shake vial thoroughly to form solution.Immediately withdraw a volume equal to 15 mg/kg of body weight (not to exceed 1 g/day) and administer by deep intramuscular injection into a large muscle mass (such as the gluteal muscles or lateral part of the thigh).The reconstituted IM solution should be used within 1 hour after preparation. NOTE: THE RECONSTITUTED SOLUTION SHOULD NOT BE ADMINISTERED INTRAVENOUSLY. ADD-Vantage®Registered trademark of Hospira Laboratories, Inc. VialsINVANZ in ADD-Vantage® vials should be reconstituted with ADD-Vantage® diluent containers containing 50 mL or 100 mL of 0.9% Sodium Chloride Injection. INSTRUCTIONS FOR USE OFINVANZ®(Ertapenem for Injection)IN ADD-Vantage VIALSFor I.V. Use Only.To Open Diluent Container:Peel overwrap from the corner and remove container. Some opacity of the plastic due to moisture absorption during the sterilization process may be observed. This is normal and does not affect the solution quality or safety. The opacity will diminish gradually.To Assemble Vial and Flexible Diluent Container:(Use Aseptic Technique)Remove the protective covers from the top of the vial and the vial port on the diluent container as follows:To remove the breakaway vial cap, swing the pull ring over the top of the vial and pull down far enough to start the opening. (SEE FIGURE 1.) Pull the ring approximately half way around the cap and then pull straight up to remove the cap. (SEE FIGURE 2.) NOTE: DO NOT ACCESS VIAL WITH SYRINGE.To remove the vial port cover, grasp the tab on the pull ring, pull up to break the three tie strings, then pull back to remove the cover. (SEE FIGURE 3. )Screw the vial into the vial port until it will go no further. THE VIAL MUST BE SCREWED IN TIGHTLY TO ASSURE A SEAL. This occurs approximately ½ turn (180°) after the first audible click. (SEE FIGURE 4.) The clicking sound does not assure a seal; the vial must be turned as far as it will go. NOTE: Once vial is seated, do not attempt to remove. (SEE FIGURE 4. )Recheck the vial to assure that it is tight by trying to turn it further in the direction of assembly.Label appropriately.To Prepare Admixture:Squeeze the bottom of the diluent container gently to inflate the portion of the container surrounding the end of the drug vial.With the other hand, push the drug vial down into the container telescoping the walls of the container. Grasp the inner cap of the vial through the walls of the container. (SEE FIGURE 5. )Pull the inner cap from the drug vial. (SEE FIGURE 6.) Verify that the rubber stopper has been pulled out, allowing the drug and diluent to mix.Mix container contents thoroughly and use within the specified time.Preparation for Administration:(Use Aseptic Technique)Confirm the activation and admixture of vial contents.Check for leaks by squeezing container firmly. If leaks are found, discard unit as sterility may be impaired.Close flow control clamp of administration set.Remove cover from outlet port at bottom of container.Insert piercing pin of administration set into port with a twisting motion until the pin is firmly seated. NOTE: See full directions on administration set carton.Lift the free end of the hanger loop on the bottom of the vial, breaking the two tie strings. Bend the loop outward to lock it in the upright position, then suspend container from hanger.Squeeze and release drip chamber to establish proper fluid level in chamber.Open flow control clamp and clear air from set. Close clamp.Attach set to venipuncture device. If device is not indwelling, prime and make venipuncture.Regulate rate of administration with flow control clamp.WARNING: Do not use flexible container in series connections.StorageINVANZ (Ertapenem for Injection) 1 g single dose ADD-Vantage® vials should be prepared with ADD-Vantage® diluent containers containing 50 mL or 100 mL of 0.9% Sodium Chloride Injection. When prepared with this diluent, INVANZ (Ertapenem for Injection) maintains satisfactory potency for 6 hours at room temperature (25°C) or for 24 hours under refrigeration (5°C) and used within 4 hours after removal from refrigeration. Solutions of INVANZ should not be frozen.Before administering, see accompanying package circular for INVANZ (Ertapenem for Injection).Parenteral drug products should be inspected visually for particulate matter and discoloration prior to use, whenever solution and container permit. Solutions of INVANZ range from colorless to pale yellow. Variations of color within this range do not affect the potency of the product. VialsINVANZ is a sterile lyophilized powder in a vial containing 1.046 g ertapenem sodium equivalent to 1 g ertapenem for intravenous infusion or for intramuscular injection.ADD-Vantage® VialsINVANZ is a lyophilized powder in an ADD-Vantage® vial containing 1.046 g ertapenem sodium equivalent to 1 g ertapenem for intravenous infusion. INVANZ is contraindicated in patients with known hypersensitivity to any component of this product or to other drugs in the same class or in patients who have demonstrated anaphylactic reactions to beta-lactams. Due to the use of lidocaine HCl as a diluent, INVANZ administered intramuscularly is contraindicated in patients with a known hypersensitivity to local anesthetics of the amide type. Serious and occasionally fatal hypersensitivity (anaphylactic) reactions have been reported in patients receiving therapy with beta-lactams. These reactions are more likely to occur in individuals with a history of sensitivity to multiple allergens. There have been reports of individuals with a history of penicillin hypersensitivity who have experienced severe hypersensitivity reactions when treated with another beta-lactam. Before initiating therapy with INVANZ, careful inquiry should be made concerning previous hypersensitivity reactions to penicillins, cephalosporins, other beta-lactams and other allergens. If an allergic reaction to INVANZ occurs, discontinue the drug immediately. Serious anaphylactic reactions require immediate emergency treatment as clinically indicated. Seizures and other central nervous system (CNS) adverse experiences have been reported during treatment with INVANZ [see Adverse Reactions (6.1)]. During clinical investigations in adult patients treated with INVANZ (1 g once a day), seizures, irrespective of drug relationship, occurred in 0.5% of patients during study therapy plus 14-day follow-up period [see Adverse Reactions (6.1)]. These experiences have occurred most commonly in patients with CNS disorders (e.g., brain lesions or history of seizures) and/or compromised renal function. Close adherence to the recommended dosage regimen is urged, especially in patients with known factors that predispose to convulsive activity. Anticonvulsant therapy should be continued in patients with known seizure disorders. If focal tremors, myoclonus, or seizures occur, patients should be evaluated neurologically, placed on anticonvulsant therapy if not already instituted, and the dosage of INVANZ re-examined to determine whether it should be decreased or discontinued. Case reports in the literature have shown that co-administration of carbapenems, including ertapenem, to patients receiving valproic acid or divalproex sodium results in a reduction in valproic acid concentrations. The valproic acid concentrations may drop below the therapeutic range as a result of this interaction, therefore increasing the risk of breakthrough seizures. Increasing the dose of valproic acid or divalproex sodium may not be sufficient to overcome this interaction. The concomitant use of ertapenem and valproic acid/divalproex sodium is generally not recommended. Anti-bacterials other than carbapenems should be considered to treat infections in patients whose seizures are well controlled on valproic acid or divalproex sodium. If administration of INVANZ is necessary, supplemental anti-convulsant therapy should be considered [see Drug Interactions (7.2)]. CDAD has been reported with use of nearly all antibacterial agents, including ertapenem, and may range in severity from mild diarrhea to fatal colitis. Treatment with antibacterial agents alters the normal flora of the colon leading to overgrowth of Clostridium difficile.Clostridium difficile produces toxins A and B which contribute to the development of CDAD. Hypertoxin producing strains of Clostridium difficile cause increased morbidity and mortality, as these infections can be refractory to antimicrobial therapy and may require colectomy. CDAD must be considered in all patients who present with diarrhea following antibiotic use. Careful medical history is necessary since CDAD has been reported to occur over two months after the administration of antibacterial agents.If CDAD is suspected or confirmed, ongoing antibiotic use not directed against Clostridium difficile may need to be discontinued. Appropriate fluid and electrolyte management, protein supplementation, antibiotic treatment of Clostridium difficile, and surgical evaluation should be instituted as clinically indicated. Caution should be taken when administering INVANZ intramuscularly to avoid inadvertent injection into a blood vessel [see Dosage and Administration (2.7)]. As with other antibiotics, prolonged use of INVANZ may result in overgrowth of non-susceptible organisms. Repeated evaluation of the patient's condition is essential. If superinfection occurs during therapy, appropriate measures should be taken.Prescribing INVANZ in the absence of a proven or strongly suspected bacterial infection or a prophylactic indication is unlikely to provide benefit to the patient and increases the risk of the development of drug-resistant bacteria. While INVANZ possesses toxicity similar to the beta-lactam group of antibiotics, periodic assessment of organ system function, including renal, hepatic, and hematopoietic, is advisable during prolonged therapy. Because clinical trials are conducted under widely varying conditions, adverse reaction rates observed in the clinical trials of a drug cannot be directly compared to rates in the clinical trials of another drug and may not reflect the rates observed in practice. Adults Receiving INVANZ as a Treatment RegimenClinical trials enrolled 1954 patients treated with INVANZ; in some of the clinical trials, parenteral therapy was followed by a switch to an appropriate oral antimicrobial [see Clinical Studies (14)]. Most adverse experiences reported in these clinical trials were described as mild to moderate in severity. INVANZ was discontinued due to adverse experiences in 4.7% of patients. Table 3 shows the incidence of adverse experiences reported in ≥2.0% of patients in these trials. The most common drug-related adverse experiences in patients treated with INVANZ, including those who were switched to therapy with an oral antimicrobial, were diarrhea (5.5%), infused vein complication (3.7%), nausea (3.1%), headache (2.2%), and vaginitis in females (2.1%). Table 3: Incidence (%) of Adverse Experiences Reported During Study Therapy Plus 14-Day Follow-Up in ≥2.0% of Adult Patients Treated With INVANZ in Clinical TrialsINVANZIncludes Phase IIb/III Complicated intra-abdominal infections, Complicated skin and skin structure infections and Acute pelvic infections trials1 g dailyPiperacillin/ Tazobactam3.375 g q6hINVANZIncludes Phase IIb/III Community acquired pneumonia and Complicated urinary tract infections, and Phase IIa trials1 g dailyCeftriaxone1 or 2 g dailyAdverse Events(N=802)(N=774) (N=1152)(N=942) Local: Infused vein complication 7.17.95.46.7 Systemic: Death 2.51.61.31.6 Edema/swelling 3.42.52.93.3 Fever 5.06.62.33.4 Abdominal pain3.64.84.33.9 Hypotension 2.01.41.01.2 Constipation 4.05.43.33.1 Diarrhea 10.312.19.29.8 Nausea 8.58.76.47.4 Vomiting 3.75.34.04.0 Altered mental status Includes agitation, confusion, disorientation, decreased mental acuity, changed mental status, somnolence, stupor5.13.43.32.5 Dizziness 2.13.01.52.1 Headache 5.65.46.86.9 Insomnia 3.25.23.04.1 Dyspnea 2.61.81.02.4 Pruritus 2.02.61.01.9 Rash 2.53.12.31.5 Vaginitis1.41.03.33.7In patients treated for complicated intra-abdominal infections, death occurred in 4.7% (15/316) of patients receiving INVANZ and 2.6% (8/307) of patients receiving comparator drug. These deaths occurred in patients with significant co-morbidity and/or severe baseline infections. Deaths were considered unrelated to study drugs by investigators.In clinical trials, seizure was reported during study therapy plus 14-day follow-up period in 0.5% of patients treated with INVANZ, 0.3% of patients treated with piperacillin/tazobactam and 0% of patients treated with ceftriaxone [see Warnings and Precautions (5.2)].Additional adverse experiences that were reported with INVANZ with an incidence >0.1% within each body system are listed belowBody as a Whole: abdominal distention, pain, chills, septicemia, septic shock, dehydration, gout, malaise, asthenia/fatigue, necrosis, candidiasis, weight loss, facial edema, injection site induration, injection site pain, extravasation, phlebitis/thrombophlebitis, flank pain, syncopeCardiovascular System: heart failure, hematoma, chest pain, hypertension, tachycardia, cardiac arrest, bradycardia, arrhythmia, atrial fibrillation, heart murmur, ventricular tachycardia, asystole, subdural hemorrhageDigestive System: acid regurgitation, oral candidiasis, dyspepsia, gastrointestinal hemorrhage, anorexia, flatulence, C. difficile-associated diarrhea, stomatitis, dysphagia, hemorrhoids, ileus, cholelithiasis, duodenitis, esophagitis, gastritis, jaundice, mouth ulcer, pancreatitis, pyloric stenosisMusculoskeletal System: leg painNervous System & Psychiatric: anxiety, nervousness, seizure [see Warnings and Precautions (5.2)], tremor, depression, hypesthesia, spasm, paresthesia, aggressive behavior, vertigoRespiratory System: cough, pharyngitis, rales/rhonchi, respiratory distress, pleural effusion, hypoxemia, bronchoconstriction, pharyngeal discomfort, epistaxis, pleuritic pain, asthma, hemoptysis, hiccups, voice disturbanceSkin & Skin Appendage: erythema, sweating, dermatitis, desquamation, flushing, urticariaSpecial Senses: taste perversionUrogenital System: renal impairment, oliguria/anuria, vaginal pruritus, hematuria, urinary retention, bladder dysfunction, vaginal candidiasis, vulvovaginitis. In a clinical trial for the treatment of diabetic foot infections in which 289 adult diabetic patients were treated with INVANZ, the adverse experience profile was generally similar to that seen in previous clinical trials.Prophylaxis of Surgical Site Infection following Elective Colorectal SurgeryIn a clinical trial in adults for the prophylaxis of surgical site infection following elective colorectal surgery in which 476 patients received a 1 g dose of INVANZ 1 hour prior to surgery and were then followed for safety 14 days post surgery, the overall adverse experience profile was generally comparable to that observed for INVANZ in previous clinical trials. Table 4 shows the incidence of adverse experiences other than those previously described above for INVANZ that were reported regardless of causality in ≥2.0% of patients in this trial.Table 4: Incidence (%) of Adverse Experiences Reported During Study Therapy Plus 14-Day Follow-Up in ≥2.0% of Adult Patients Treated With INVANZ for Prophylaxis of Surgical Site Infections Following Elective Colorectal Surgery Adverse EventsINVANZ1 g (N = 476) Cefotetan2 g(N = 476)Anemia5.76.9Small intestinal obstruction2.11.9Pneumonia2.14.0Postoperative infection2.34.0Urinary tract infection3.85.5Wound infection6.512.4Wound complication2.92.3Atelectasis3.41.9Additional adverse experiences that were reported in this prophylaxis trial with INVANZ, regardless of causality, with an incidence >0.5% within each body system are listed below:Gastrointestinal Disorders: C. difficile infection or colitis, dry mouth, hematocheziaGeneral Disorders and Administration Site Condition: crepitationsInfections and Infestations: cellulitis, abdominal abscess, fungal rash, pelvic abscessInjury, Poisoning and Procedural Complications: incision site complication, incision site hemorrhage, intestinal stoma complication, anastomotic leak, seroma, wound dehiscence, wound secretionMusculoskeletal and Connective Tissue Disorders: muscle spasmsNervous System Disorders: cerebrovascular accidentRenal and Urinary Disorders: dysuria, pollakiuriaRespiratory, Thoracic and Mediastinal Disorders: crackles lung, lung infiltration, pulmonary congestion, pulmonary embolism, wheezing.Pediatric Patients Receiving INVANZ as a Treatment RegimenClinical trials enrolled 384 patients treated with INVANZ; in some of the clinical trials, parenteral therapy was followed by a switch to an appropriate oral antimicrobial [see Clinical Studies (14)]. The overall adverse experience profile in pediatric patients is comparable to that in adult patients. Table 5 shows the incidence of adverse experiences reported in ≥2.0% of pediatric patients in clinical trials. The most common drug-related adverse experiences in pediatric patients treated with INVANZ, including those who were switched to therapy with an oral antimicrobial, were diarrhea (6.5%), infusion site pain (5.5%), infusion site erythema (2.6%), vomiting (2.1%).Table 5: Incidence (%) of Adverse Experiences Reported During Study Therapy Plus 14-Day Follow-Up in ≥2.0% of Pediatric Patients Treated With INVANZ in Clinical TrialsINVANZIncludes Phase IIb Complicated skin and skin structure infections, Community acquired pneumonia and Complicated urinary tract infections trials in which patients 3 months to 12 years of age received INVANZ 15 mg/kg IV twice daily up to a maximum of 1 g or ceftriaxone 50 mg/kg/day IV in two divided doses up to a maximum of 2 g, and patients 13 to 17 years of age received INVANZ 1 g IV daily or ceftriaxone 50 mg/kg/day IV in a single daily dose.,Includes Phase IIb Acute pelvic infections and Complicated intra-abdominal infections trials in which patients 3 months to 12 years of age received INVANZ 15 mg/kg IV twice daily up to a maximum of 1 g and patients 13 to 17 years of age received INVANZ 1 g IV daily or ticarcillin/clavulanate 50 mg/kg for patients <60 kg or ticarcillin/clavulanate 3.0 g for patients >60 kg, 4 or 6 times a day.CeftriaxoneTicarcillin/ ClavulanateAdverse Events (N=384)(N=100)(N=24) Local: Infusion Site Erythema3.93.08.3 Infusion Site Pain7.04.020.8 Systemic: Abdominal Pain4.73.04.2 Constipation2.30.00.0 Diarrhea11.717.04.2 Loose Stools2.10.00.0 Vomiting10.211.08.3 Pyrexia4.96.08.3 Upper Respiratory Tract Infection2.33.00.0 Headache4.44.00.0 Cough4.43.00.0 Diaper Dermatitis 4.74.00.0 Rash2.92.08.3Additional adverse experiences that were reported with INVANZ with an incidence >0.5% within each body system are listed below:Gastrointestinal Disorders: nauseaGeneral Disorders and Administration Site Condition: hypothermia, chest pain, upper abdominal pain; infusion site pruritus, induration, phlebitis, swelling, and warmthInfections and Infestations: candidiasis, oral candidiasis, viral pharyngitis, herpes simplex, ear infection, abdominal abscessMetabolism and Nutrition Disorders: decreased appetiteMusculoskeletal and Connective Tissue Disorders: arthralgiaNervous System Disorders: dizziness, somnolencePsychiatric Disorders: insomniaReproductive System and Breast Disorders: genital rashRespiratory, Thoracic and Mediastinal Disorders: wheezing, nasopharyngitis, pleural effusion, rhinitis, rhinorrheaSkin and Subcutaneous Tissue Disorders: dermatitis, pruritus, rash erythematous, skin lesionVascular Disorders: phlebitis. Adults Receiving INVANZ as Treatment RegimenLaboratory adverse experiences that were reported during therapy in ≥2.0% of adult patients treated with INVANZ in clinical trials are presented in Table 6. Drug-related laboratory adverse experiences that were reported during therapy in ≥2.0% of adult patients treated with INVANZ, including those who were switched to therapy with an oral antimicrobial, in clinical trials were ALT increased (6.0%), AST increased (5.2%), serum alkaline phosphatase increased (3.4%), and platelet count increased (2.8%). INVANZ was discontinued due to laboratory adverse experiences in 0.3% of patients.Table 6: IncidenceNumber of patients with laboratory adverse experiences/Number of patients with the laboratory test (%) of Laboratory Adverse Experiences Reported During Study Therapy Plus 14-Day Follow-Up in ≥2.0% of Adult Patients Treated With INVANZ in Clinical TrialsINVANZIncludes Phase IIb/III Complicated intra-abdominal infections, Complicated skin and skin structure infections and Acute pelvic infections trials1 g dailyPiperacillin/ Tazobactam3.375 g q6hINVANZIncludes Phase IIb/III Community acquired pneumonia and Complicated urinary tract infections, and Phase IIa trials1 g dailyCeftriaxone1 or 2 g dailyAdverse laboratory experiences(nNumber of patients with one or more laboratory tests=766)(n=755)(n=1122)(n=920)ALT increased 8.87.38.36.9AST increased 8.48.37.16.5Serum alkaline phosphatase increased 6.67.24.32.8Eosinophils increased 1.11.12.11.8Hematocrit decreased 3.02.93.42.4Hemoglobin decreased 4.94.74.53.5Platelet count increased 6.56.34.33.5Urine RBCs increased 2.52.91.11.0Urine WBCs increased 2.53.21.61.1Additional laboratory adverse experiences that were reported during therapy in >0.1% of patients treated with INVANZ in clinical trials include: increases in serum creatinine, serum glucose, BUN, total, direct and indirect serum bilirubin, serum sodium and potassium, PT and PTT; decreases in serum potassium, serum albumin, WBC, platelet count, and segmented neutrophils. In a clinical trial for the treatment of diabetic foot infections in which 289 adult diabetic patients were treated with INVANZ, the laboratory adverse experience profile was generally similar to that seen in previous clinical trials.Prophylaxis of Surgical Site Infection following Elective Colorectal SurgeryIn a clinical trial in adults for the prophylaxis of surgical site infection following elective colorectal surgery in which 476 patients received a 1 g dose of INVANZ 1 hour prior to surgery and were then followed for safety 14 days post surgery, the overall laboratory adverse experience profile was generally comparable to that observed for INVANZ in previous clinical trials. Pediatric Patients Receiving INVANZ as a Treatment RegimenLaboratory adverse experiences that were reported during therapy in ≥2.0% of pediatric patients treated with INVANZ in clinical trials are presented in Table 7. Drug-related laboratory adverse experiences that were reported during therapy in ≥2.0% of pediatric patients treated with INVANZ, including those who were switched to therapy with an oral antimicrobial, in clinical trials were neutrophil count decreased (3.0%), ALT increased (2.2%), and AST increased (2.1%).Table 7: IncidenceNumber of patients with laboratory adverse experiences/Number of patients with the laboratory test; where at least 300 patients had the test (%) of Specific Laboratory Adverse Experiences Reported During Study Therapy Plus 14-Day Follow-Up in ≥2.0% of Pediatric Patients Treated With INVANZ in Clinical TrialsINVANZCeftriaxoneTicarcillin/ ClavulanateAdverse laboratory experiences(nNumber of patients with one or more laboratory tests=379) (n=97)(n=24)ALT Increased3.81.14.3AST Increased3.81.14.3Neutrophil Count Decreased5.83.10.0Additional laboratory adverse experiences that were reported during therapy in >0.5% of patients treated with INVANZ in clinical trials include: alkaline phosphatase increased, eosinophil count increased, platelet count increased, white blood cell count decreased and urine protein present. Probenecid interferes with the active tubular secretion of ertapenem, resulting in increased plasma concentrations of ertapenem [see Clinical Pharmacology (12.3)]. Co-administration of probenecid with ertapenem is not recommended. Case reports in the literature have shown that co-administration of carbapenems, including ertapenem, to patients receiving valproic acid or divalproex sodium results in a reduction of valproic acid concentrations. The valproic acid concentrations may drop below the therapeutic range as a result of this interaction, therefore increasing the risk of breakthrough seizures. Although the mechanism of this interaction is unknown, data from in vitro and animal studies suggest that carbapenems may inhibit the hydrolysis of valproic acid's glucuronide metabolite (VPA-g) back to valproic acid, thus decreasing the serum concentrations of valproic acid [see Warnings and Precautions (5.3)]. Pregnancy Category BIn mice and rats given intravenous doses of up to 700 mg/kg/day (for mice, approximately 3 times the recommended human dose of 1 g based on body surface area and for rats, approximately 1.2 times the human exposure at the recommended dose of 1 g based on plasma AUCs), there was no evidence of developmental toxicity as assessed by external, visceral, and skeletal examination of the fetuses. However, in mice given 700 mg/kg/day, slight decreases in average fetal weights and an associated decrease in the average number of ossified sacrocaudal vertebrae were observed. Ertapenem crosses the placental barrier in rats.There are, however, no adequate and well-controlled trials in pregnant women. Because animal reproduction studies are not always predictive of human response, this drug should be used during pregnancy only if clearly needed. INVANZ has not been studied for use during labor and delivery. Ertapenem is excreted in human breast milk [see Clinical Pharmacology (12.3)]. Caution should be exercised when INVANZ is administered to a nursing woman. INVANZ should be administered to nursing mothers only when the expected benefit outweighs the risk. Safety and effectiveness of INVANZ in pediatric patients 3 months to 17 years of age are supported by evidence from adequate and well-controlled trials in adults, pharmacokinetic data in pediatric patients, and additional data from comparator-controlled trials in pediatric patients 3 months to 17 years of age [see Indications and Usage (1.1), (1.2), (1.3), (1.4) and (1.5) and Clinical Studies (14.2)].INVANZ is not recommended in infants under 3 months of age as no data are available. INVANZ is not recommended in the treatment of meningitis in the pediatric population due to lack of sufficient CSF penetration. Of the 1,835 patients in Phase 2b/3 trials treated with INVANZ, approximately 26 percent were 65 and over, while approximately 12 percent were 75 and over. No overall differences in safety or effectiveness were observed between these patients and younger patients. Other reported clinical experience has not identified differences in responses between the elderly and younger patients, but greater sensitivity of some older individuals cannot be ruled out. This drug is known to be substantially excreted by the kidney, and the risk of toxic reactions to this drug may be greater in patients with impaired renal function. Because elderly patients are more likely to have decreased renal function, care should be taken in dose selection, and it may be useful to monitor renal function [see Dosage and Administration (2.2)]. Dosage adjustment is necessary in patients with creatinine clearance 30 mL/min or less [see Dosage and Administration (2.4) and Clinical Pharmacology (12.3)]. The pharmacokinetics of ertapenem in patients with hepatic impairment have not been established. Of the total number of patients in clinical trials, 37 patients receiving ertapenem 1 g daily and 36 patients receiving comparator drugs were considered to have Child-Pugh Class A, B, or C liver impairment. The incidence of adverse experiences in patients with hepatic impairment was similar between the ertapenem group and the comparator groups. No specific information is available on the treatment of overdosage with INVANZ. Intentional overdosing of INVANZ is unlikely. Intravenous administration of INVANZ at a dose of 2 g over 30 min or 3 g over 1-2h in healthy adult volunteers resulted in an increased incidence of nausea. In clinical trials in adults, inadvertent administration of three 1 g doses of INVANZ in a 24 hour period resulted in diarrhea and transient dizziness in one patient. In pediatric clinical trials, a single intravenous dose of 40 mg/kg up to a maximum of 2 g did not result in toxicity. In the event of an overdose, INVANZ should be discontinued and general supportive treatment given until renal elimination takes place. INVANZ can be removed by hemodialysis; the plasma clearance of the total fraction of ertapenem was increased 30% in subjects with end-stage renal disease when hemodialysis (4 hour session) was performed immediately following administration. However, no information is available on the use of hemodialysis to treat overdosage. 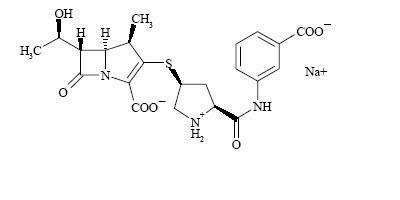 INVANZ (Ertapenem for Injection) is a sterile, synthetic, parenteral, 1-β methyl-carbapenem that is structurally related to beta-lactam antibiotics.Chemically, INVANZ is described as [4R-[3(3S*,5S*),4α,5β,6β(R*)]]-3-[[5-[[(3-carboxyphenyl)amino]carbonyl]-3-pyrrolidinyl]thio]-6-(1-hydroxyethyl)-4-methyl-7-oxo-1-azabicyclo[3.2.0]hept-2-ene-2-carboxylic acid monosodium salt. Its molecular weight is 497.50. The empirical formula is C22H24N3O7SNa, and its structural formula is:Ertapenem sodium is a white to off-white hygroscopic, weakly crystalline powder. It is soluble in water and 0.9% sodium chloride solution, practically insoluble in ethanol, and insoluble in isopropyl acetate and tetrahydrofuran. INVANZ is supplied as sterile lyophilized powder for intravenous infusion after reconstitution with appropriate diluent [see Dosage and Administration (2.7)] and transfer to 50 mL 0.9% Sodium Chloride Injection or for intramuscular injection following reconstitution with 1% lidocaine hydrochloride. Each vial contains 1.046 grams ertapenem sodium, equivalent to 1 gram ertapenem. The sodium content is approximately 137 mg (approximately 6.0 mEq). Each vial of INVANZ contains the following inactive ingredients: 175 mg sodium bicarbonate and sodium hydroxide to adjust pH to 7.5. Ertapenem sodium is a carbapenem antibiotic [see Clinical Pharmacology (12.4)]. Average plasma concentrations (mcg/mL) of ertapenem following a single 30-minute infusion of a 1 g intravenous (IV) dose and administration of a single 1 g intramuscular (IM) dose in healthy young adults are presented in Table 8.Table 8: Plasma Concentrations of Ertapenem in Adults After Single Dose AdministrationAverage Plasma Concentrations (mcg/mL)Dose/Route0.5 hr1 hr2 hr4 hr6 hr8 hr12 hr18 hr24 hr1 g IVInfused at a constant rate over 30 minutes155115834831209311 g IM3353675740271342The area under the plasma concentration-time curve (AUC) of ertapenem in adults increased less-than dose-proportional based on total ertapenem concentrations over the 0.5 to 2 g dose range, whereas the AUC increased greater-than dose-proportional based on unbound ertapenem concentrations. Ertapenem exhibits non-linear pharmacokinetics due to concentration-dependent plasma protein binding at the proposed therapeutic dose [see Clinical Pharmacology (12.3)]. There is no accumulation of ertapenem following multiple IV or IM 1 g daily doses in healthy adults.Average plasma concentrations (mcg/mL) of ertapenem in pediatric patients are presented in Table 9.Table 9: Plasma Concentrations of Ertapenem in Pediatric Patients After Single IVInfused at a constant rate over 30 minutes Dose AdministrationAge GroupDoseAverage Plasma Concentrations (mcg/mL)0.5 hr1 hr2 hr4 hr6 hr8 hr12 hr24 hr3 to 23 months15 mg/kgup to a maximum dose of 1 g/day103.857.343.623.713.58.22.5-20 mg/kg126.887.658.728.4-12.03.40.440 mg/kgup to a maximum dose of 2 g/day199.1144.195.758.0-20.27.70.62 to 12 years15 mg/kg113.263.942.121.912.87.63.0-20 mg/kg147.697.663.234.5-12.34.90.540 mg/kg241.7152.796.355.6-18.87.20.613 to 17 years20 mg/kg170.498.367.840.4-16.07.01.11 gBased on three patients receiving 1 g ertapenem who volunteered for pharmacokinetic assessment in one of the two safety and efficacy trials155.9110.974.8-24.0-6.2-40 mg/kg255.0188.7127.976.2-31.015.32.1AbsorptionErtapenem, reconstituted with 1% lidocaine HCl injection, USP (in saline without epinephrine), is almost completely absorbed following intramuscular (IM) administration at the recommended dose of 1 g. The mean bioavailability is approximately 90%. Following 1 g daily IM administration, mean peak plasma concentrations (Cmax) are achieved in approximately 2.3 hours (Tmax).DistributionErtapenem is highly bound to human plasma proteins, primarily albumin. In healthy young adults, the protein binding of ertapenem decreases as plasma concentrations increase, from approximately 95% bound at an approximate plasma concentration of <100 micrograms (mcg)/mL to approximately 85% bound at an approximate plasma concentration of 300 mcg/mL. The apparent volume of distribution at steady state (Vss) of ertapenem in adults is approximately 0.12 liter/kg, approximately 0.2 liter/kg in pediatric patients 3 months to 12 years of age and approximately 0.16 liter/kg in pediatric patients 13 to 17 years of age. The concentrations of ertapenem achieved in suction-induced skin blister fluid at each sampling point on the third day of 1 g once daily IV doses are presented in Table 10. The ratio of AUC0-24 in skin blister fluid/AUC0-24 in plasma is 0.61.Table 10: Concentrations (mcg/mL) of Ertapenem in Adult Skin Blister Fluid at each Sampling Point on the Third Day of 1-g Once Daily IV Doses 0.5 hr1 hr2 hr4 hr8 hr12 hr24 hr712172424218The concentration of ertapenem in breast milk from 5 lactating women with pelvic infections (5 to 14 days postpartum) was measured at random time points daily for 5 consecutive days following the last 1 g dose of intravenous therapy (3-10 days of therapy). The concentration of ertapenem in breast milk within 24 hours of the last dose of therapy in all 5 women ranged from <0.13 (lower limit of quantitation) to 0.38 mcg/mL; peak concentrations were not assessed. By day 5 after discontinuation of therapy, the level of ertapenem was undetectable in the breast milk of 4 women and below the lower limit of quantitation (<0.13 mcg/mL) in 1 woman.MetabolismIn healthy young adults, after infusion of 1 g IV radiolabeled ertapenem, the plasma radioactivity consists predominantly (94%) of ertapenem. The major metabolite of ertapenem is the inactive ring-opened derivative formed by hydrolysis of the beta-lactam ring. EliminationErtapenem is eliminated primarily by the kidneys. The mean plasma half-life in healthy young adults is approximately 4 hours and the plasma clearance is approximately 1.8 L/hour. The mean plasma half-life in pediatric patients 13 to 17 years of age is approximately 4 hours and approximately 2.5 hours in pediatric patients 3 months to 12 years of age. Following the administration of 1 g IV radiolabeled ertapenem to healthy young adults, approximately 80% is recovered in urine and 10% in feces. Of the 80% recovered in urine, approximately 38% is excreted as unchanged drug and approximately 37% as the ring-opened metabolite. In healthy young adults given a 1 g IV dose, the mean percentage of the administered dose excreted in urine was 17.4% during 0-2 hours postdose, 5.4% during 4-6 hours postdose, and 2.4% during 12-24 hours postdose. Special PopulationsRenal ImpairmentTotal and unbound fractions of ertapenem pharmacokinetics were investigated in 26 adult subjects (31 to 80 years of age) with varying degrees of renal impairment. Following a single 1 g IV dose of ertapenem, the unbound AUC increased 1.5-fold and 2.3-fold in subjects with mild renal impairment (CLCR 60-90 mL/min/1.73 m2) and moderate renal impairment (CLCR 31-59 mL/min/1.73 m2), respectively, compared with healthy young subjects (25 to 45 years of age). No dosage adjustment is necessary in patients with CLCR ≥31 mL/min/1.73 m2. The unbound AUC increased 4.4-fold and 7.6-fold in subjects with advanced renal impairment (CLCR 5-30 mL/min/1.73 m2) and end-stage renal disease (CLCR <10 mL/min/1.73 m2), respectively, compared with healthy young subjects. The effects of renal impairment on AUC of total drug were of smaller magnitude. The recommended dose of ertapenem in adult patients with CLCR ≤30 mL/min/1.73 m2 is 0.5 grams every 24 hours. Following a single 1 g IV dose given immediately prior to a 4 hour hemodialysis session in 5 adult patients with end-stage renal disease, approximately 30% of the dose was recovered in the dialysate. Dose adjustments are recommended for patients with severe renal impairment and end-stage renal disease [see Dosage and Administration (2.4)]. There are no data in pediatric patients with renal impairment.Hepatic ImpairmentThe pharmacokinetics of ertapenem in patients with hepatic impairment have not been established. However, ertapenem does not appear to undergo hepatic metabolism based on in vitro studies and approximately 10% of an administered dose is recovered in the feces [see Clinical Pharmacology (12.3) and Dosage and Administration (2.6)].GenderThe effect of gender on the pharmacokinetics of ertapenem was evaluated in healthy male (n=8) and healthy female (n=8) subjects. The differences observed could be attributed to body size when body weight was taken into consideration. No dose adjustment is recommended based on gender.Geriatric PatientsThe impact of age on the pharmacokinetics of ertapenem was evaluated in healthy male (n=7) and healthy female (n=7) subjects ≥65 years of age. The total and unbound AUC increased 37% and 67%, respectively, in elderly adults relative to young adults. These changes were attributed to age-related changes in creatinine clearance. No dosage adjustment is necessary for elderly patients with normal (for their age) renal function.Pediatric PatientsPlasma concentrations of ertapenem are comparable in pediatric patients 13 to 17 years of age and adults following a 1 g once daily IV dose.Following the 20 mg/kg dose (up to a maximum dose of 1 g), the pharmacokinetic parameter values in patients 13 to 17 years of age (N=6) were generally comparable to those in healthy young adults.Plasma concentrations at the midpoint of the dosing interval following a single 15 mg/kg IV dose of ertapenem in patients 3 months to 12 years of age are comparable to plasma concentrations at the midpoint of the dosing interval following a 1 g once daily IV dose in adults [see Clinical Pharmacology (12.3)]. The plasma clearance (mL/min/kg) of ertapenem in patients 3 months to 12 years of age is approximately 2-fold higher as compared to that in adults. At the 15 mg/kg dose, the AUC value (doubled to model a twice daily dosing regimen, i.e., 30 mg/kg/day exposure) in patients 3 months to 12 years of age was comparable to the AUC value in young healthy adults receiving a 1 g IV dose of ertapenem.Drug InteractionsWhen ertapenem is co-administered with probenecid (500 mg p.o. every 6 hours), probenecid competes for active tubular secretion and reduces the renal clearance of ertapenem. Based on total ertapenem concentrations, probenecid increased the AUC of ertapenem by 25%, and reduced the plasma and renal clearance of ertapenem by 20% and 35%, respectively. The half-life of ertapenem was increased from 4.0 to 4.8 hours.In vitro studies in human liver microsomes indicate that ertapenem does not inhibit metabolism mediated by any of the following cytochrome p450 (CYP) isoforms: 1A2, 2C9, 2C19, 2D6, 2E1 and 3A4.In vitro studies indicate that ertapenem does not inhibit P-glycoprotein-mediated transport of digoxin or vinblastine and that ertapenem is not a substrate for P-glycoprotein-mediated transport. No long-term studies in animals have been performed to evaluate the carcinogenic potential of ertapenem.Ertapenem was neither mutagenic nor genotoxic in the following in vitro assays: alkaline elution/rat hepatocyte assay, chromosomal aberration assay in Chinese hamster ovary cells, and TK6 human lymphoblastoid cell mutagenesis assay; and in the in vivo mouse micronucleus assay. In mice and rats, IV doses of up to 700 mg/kg/day (for mice, approximately 3 times the recommended human dose of 1 g based on body surface area and for rats, approximately 1.2 times the human exposure at the recommended dose of 1 g based on plasma AUCs) resulted in no effects on mating performance, fecundity, fertility, or embryonic survival. In repeat-dose studies in rats, treatment-related neutropenia occurred at every dose-level tested, including the lowest dose of 2 mg/kg (approximately 2% of the human dose on a body surface area basis).Studies in rabbits and Rhesus monkeys were inconclusive with regard to the effect on neutrophil counts. Complicated Intra-Abdominal InfectionsErtapenem was evaluated in adults for the treatment of complicated intra-abdominal infections in a randomized, double-blind, non-inferiority clinical trial. This trial compared ertapenem (1 g intravenously once a day) with piperacillin/tazobactam (3.375 g intravenously every 6 hours) for 5 to 14 days and enrolled 665 patients with localized complicated appendicitis, and any other complicated intra-abdominal infection including colonic, small intestinal, and biliary infections and generalized peritonitis. The combined clinical and microbiologic success rates in the microbiologically evaluable population at 4 to 6 weeks posttherapy (test-of-cure) were 83.6% (163/195) for ertapenem and 80.4% (152/189) for piperacillin/tazobactam. Complicated Skin and Skin Structure InfectionsErtapenem was evaluated in adults for the treatment of complicated skin and skin structure infections in a randomized, double-blind, non-inferiority clinical trial. This trial compared ertapenem (1 g intravenously once a day) with piperacillin/tazobactam (3.375 g intravenously every 6 hours) for 7 to 14 days and enrolled 540 patients including patients with deep soft tissue abscess, posttraumatic wound infection and cellulitis with purulent drainage. The clinical success rates at 10 to 21 days posttherapy (test-of-cure) were 83.9% (141/168) for ertapenem and 85.3% (145/170) for piperacillin/tazobactam.Diabetic Foot InfectionsErtapenem was evaluated in adults for the treatment of diabetic foot infections without concomitant osteomyelitis in a multicenter, randomized, double-blind, non-inferiority clinical trial. This trial compared ertapenem (1 g intravenously once a day) with piperacillin/tazobactam (3.375 g intravenously every 6 hours). Test-of-cure was defined as clinical response between treatment groups in the clinically evaluable population at the 10-day posttherapy follow-up visit. The trial included 295 patients randomized to ertapenem and 291 patients to piperacillin/tazobactam. Both regimens allowed the option to switch to oral amoxicillin/clavulanate for a total of 5 to 28 days of treatment (parenteral and oral). All patients were eligible to receive appropriate adjunctive treatment methods, such as debridement, as is typically required in the treatment of diabetic foot infections, and most patients received these treatments. Patients with suspected osteomyelitis could be enrolled if all the infected bone was removed within 2 days of initiation of study therapy, and preferably within the prestudy period. Investigators had the option to add open-label vancomycin if enterococci or methicillin-resistant Staphylococcus aureus (MRSA) were among the pathogens isolated or if patients had a history of MRSA infection and additional therapy was indicated in the opinion of the investigator. Two hundred and four (204) patients randomized to ertapenem and 202 patients randomized to piperacillin/tazobactam were clinically evaluable. The clinical success rates at 10 days posttherapy were 75.0% (153/204) for ertapenem and 70.8% (143/202) for piperacillin/tazobactam.Community Acquired PneumoniaErtapenem was evaluated in adults for the treatment of community acquired pneumonia in two randomized, double-blind, non-inferiority clinical trials. Both trials compared ertapenem (1 g parenterally once a day) with ceftriaxone (1 g parenterally once a day) and enrolled a total of 866 patients. Both regimens allowed the option to switch to oral amoxicillin/clavulanate for a total of 10 to 14 days of treatment (parenteral and oral). In the first trial the primary efficacy parameter was the clinical success rate in the clinically evaluable population and success rates were 92.3% (168/182) for ertapenem and 91.0% (183/201) for ceftriaxone at 7 to 14 days posttherapy (test-of-cure). In the second trial the primary efficacy parameter was the clinical success rate in the microbiologically evaluable population and success rates were 91% (91/100) for ertapenem and 91.8% (45/49) for ceftriaxone at 7 to 14 days posttherapy (test-of-cure).Complicated Urinary Tract Infections Including PyelonephritisErtapenem was evaluated in adults for the treatment of complicated urinary tract infections including pyelonephritis in two randomized, double-blind, non-inferiority clinical trials. Both trials compared ertapenem (1 g parenterally once a day) with ceftriaxone (1 g parenterally once a day) and enrolled a total of 850 patients. Both regimens allowed the option to switch to oral ciprofloxacin (500 mg twice daily) for a total of 10 to 14 days of treatment (parenteral and oral). The microbiological success rates (combined trials) at 5 to 9 days posttherapy (test-of-cure) were 89.5% (229/256) for ertapenem and 91.1% (204/224) for ceftriaxone.Acute Pelvic Infections Including Endomyometritis, Septic Abortion and Post-Surgical Gynecological InfectionsErtapenem was evaluated in adults for the treatment of acute pelvic infections in a randomized, double-blind, non-inferiority clinical trial. This trial compared ertapenem (1 g intravenously once a day) with piperacillin/tazobactam (3.375 g intravenously every 6 hours) for 3 to 10 days and enrolled 412 patients including 350 patients with obstetric/postpartum infections and 45 patients with septic abortion. The clinical success rates in the clinically evaluable population at 2 to 4 weeks posttherapy (test-of-cure) were 93.9% (153/163) for ertapenem and 91.5% (140/153) for piperacillin/tazobactam.Prophylaxis of Surgical Site Infections Following Elective Colorectal SurgeryErtapenem was evaluated in adults for prophylaxis of surgical site infection following elective colorectal surgery in a multicenter, randomized, double-blind, non-inferiority clinical trial. This trial compared a single intravenous dose of ertapenem (1 g) versus cefotetan (2 g) administered over 30 minutes, 1 hour before elective colorectal surgery. Test-of-prophylaxis was defined as no evidence of surgical site infection, post-operative anastomotic leak, or unexplained antibiotic use in the clinically evaluable population up to and including at the 4-week posttreatment follow-up visit. The trial included 500 patients randomized to ertapenem and 502 patients randomized to cefotetan. The modified intent-to-treat (MITT) population consisted of 451 ertapenem patients and 450 cefotetan patients and included all patients who were randomized, treated, and underwent elective colorectal surgery with adequate bowel preparation. The clinically evaluable population was a subset of the MITT population and consisted of patients who received a complete dose of study therapy no more than two hours prior to surgical incision and no more than six hours before surgical closure. Clinically evaluable patients had sufficient information to determine outcome at the 4-week follow-up assessment and had no confounding factors that interfered with the assessment of that outcome. Examples of confounding factors included prior or concomitant antibiotic violations, the need for a second surgical procedure during the study period, and identification of a distant site infection with concomitant antibiotic administration and no evidence of subsequent wound infection. Three-hundred forty-six (346) patients randomized to ertapenem and 339 patients randomized to cefotetan were clinically evaluable. The prophylactic success rates at 4 weeks posttreatment in the clinically evaluable population were 70.5% (244/346) for ertapenem and 57.2% (194/339) for cefotetan (difference 13.3%, [95% C.I. : 6.1, 20.4], p<0.001). Prophylaxis failure due to surgical site infections occurred in 18.2% (63/346) ertapenem patients and 31.0% (105/339) cefotetan patients. Post-operative anastomotic leak occurred in 2.9% (10/346) ertapenem patients and 4.1% (14/339) cefotetan patients. Unexplained antibiotic use occurred in 8.4% (29/346) ertapenem patients and 7.7% (26/339) cefotetan patients. Though patient numbers were small in some subgroups, in general, clinical response rates by age, gender, and race were consistent with the results found in the clinically evaluable population. In the MITT analysis, the prophylactic success rates at 4 weeks posttreatment were 58.3% (263/451) for ertapenem and 48.9% (220/450) for cefotetan (difference 9.4%, [95% C.I. : 2.9, 15.9], p=0.002). A statistically significant difference favoring ertapenem over cefotetan with respect to the primary endpoint has been observed at a significance level of 5% in this trial. A second adequate and well-controlled trial to confirm these findings has not been conducted; therefore, the clinical superiority of ertapenem over cefotetan has not been demonstrated. Ertapenem was evaluated in pediatric patients 3 months to 17 years of age in two randomized, multicenter clinical trials. The first trial enrolled 404 patients and compared ertapenem (15 mg/kg intravenous (IV) every 12 hours in patients 3 months to 12 years of age, and 1 g IV once a day in patients 13 to 17 years of age) to ceftriaxone (50 mg/kg/day IV in two divided doses in patients 3 months to 12 years of age and 50 mg/kg/day IV as a single daily dose in patients 13 to 17 years of age) for the treatment of complicated urinary tract infection (UTI), skin and soft tissue infection (SSTI), or community-acquired pneumonia (CAP). Both regimens allowed the option to switch to oral amoxicillin/clavulanate for a total of up to 14 days of treatment (parenteral and oral). The microbiological success rates in the evaluable per protocol (EPP) analysis in patients treated for UTI were 87.0% (40/46) for ertapenem and 90.0% (18/20) for ceftriaxone. The clinical success rates in the EPP analysis in patients treated for SSTI were 95.5% (64/67) for ertapenem and 100% (26/26) for ceftriaxone, and in patients treated for CAP were 96.1% (74/77) for ertapenem and 96.4% (27/28) for ceftriaxone. The second trial enrolled 112 patients and compared ertapenem (15 mg/kg IV every 12 hours in patients 3 months to 12 years of age, and 1 g IV once a day in patients 13 to 17 years of age) to ticarcillin/clavulanate (50 mg/kg for patients <60 kg or 3.0 g for patients >60 kg, 4 or 6 times a day) up to 14 days for the treatment of complicated intra-abdominal infections (IAI) and acute pelvic infections (API). In patients treated for IAI (primarily patients with perforated or complicated appendicitis), the clinical success rates were 83.7% (36/43) for ertapenem and 63.6% (7/11) for ticarcillin/clavulanate in the EPP analysis. In patients treated for API (post-operative or spontaneous obstetrical endomyometritis, or septic abortion), the clinical success rates were 100% (23/23) for ertapenem and 100% (4/4) for ticarcillin/clavulanate in the EPP analysis. Clinical and Laboratory Standards Institute (CLSI). Methods for Dilution Antimicrobial Susceptibility Tests for Bacteria that Grow Aerobically. 9th Edition; CLSI Document M7-A9. CLSI, Wayne, PA, 2012. Clinical and Laboratory Standards Institute (CLSI). Performance Standards for Antimicrobial Disk Susceptibility Tests. 11th Edition; CLSI Document M2-A11. CLSI, Wayne, PA, 2012.Clinical and Laboratory Standards Institute (CLSI). Methods for Antimicrobial Susceptibility Testing of Anaerobic Bacteria – 7th Edition; CLSI Document M11-A7. CLSI, Wayne, PA, 2007.Clinical and Laboratory Standards Institute (CLSI). Performance Standards for Antimicrobial Susceptibility Testing – 22nd Informational Supplement. CLSI Document M100-S22. CLSI, Wayne, PA, 2012.Clinical and Laboratory Standards Institute (CLSI, formerly NCCLS). Performance Standards for Antimicrobial Susceptibility of Anaerobic Bacteria; Informational Supplement. CLSI Document M11-S1. CLSI, Wayne, PA, 2010. INVANZ is supplied as a sterile lyophilized powder in single dose vials containing ertapenem for intravenous infusion or for intramuscular injection as follows: No. 3843—1 g ertapenem equivalent NDC 0006-3843-71 in trays of 10 vials.INVANZ is supplied as a sterile lyophilized powder in single dose ADD-Vantage® vials containing ertapenem for intravenous infusion as follows:No. 3845—1 g ertapenem equivalentNDC 0006-3845-71 in trays of 10 ADD-Vantage® vials. Before reconstitutionDo not store lyophilized powder above 25°C (77°F).Reconstituted and infusion solutionsThe reconstituted solution, immediately diluted in 0.9% Sodium Chloride Injection [see Dosage and Administration (2.7)], may be stored at room temperature (25°C) and used within 6 hours or stored for 24 hours under refrigeration (5°C) and used within 4 hours after removal from refrigeration. Solutions of INVANZ should not be frozen. Patients should be advised that allergic reactions, including serious allergic reactions could occur and that serious reactions may require immediate treatment. Advise patients to report any previous hypersensitivity reactions to INVANZ, other beta-lactams or other allergens.Patients should be counseled to inform their physician if they are taking valproic acid or divalproex sodium. Valproic acid concentrations in the blood may drop below the therapeutic range upon co-administration with INVANZ. If treatment with INVANZ is necessary and continued, alternative or supplemental anti-convulsant medication to prevent and/or treat seizures may be needed.Patients should be counseled that antibacterial drugs including INVANZ should only be used to treat bacterial infections. They do not treat viral infections (e.g., the common cold). When INVANZ is prescribed to treat a bacterial infection, patients should be told that although it is common to feel better early in the course of therapy, the medication should be taken exactly as directed. Skipping doses or not completing the full course of therapy may (1) decrease the effectiveness of the immediate treatment and (2) increase the likelihood that bacteria will develop resistance and will not be treatable by INVANZ or other antibacterial drugs in the future.Diarrhea is a common problem caused by antibiotics which usually ends when the antibiotic is discontinued. Sometimes after starting treatment with antibiotics, patients can develop watery and bloody stools (with or without stomach cramps and fever) even as late as two or more months after having taken the last dose of the antibiotic. If this occurs, patients should contact their physician as soon as possible.